Walking in One's Own Light. Earth represents a remarkable experiment where genetic material from thousands of worlds was deposited. Along with this genetic material, all of the emotional coding and experiences of these planets and species was left, laying the ground for "The Grand Experiment". There are other timelines in which this experiment is not succeeding. But you, the version with which we are having this conversation, are successful and, hence, you are going through the ascension process. 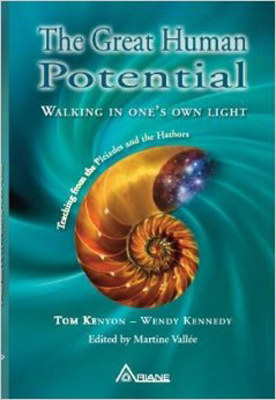 The information that is shared in this book is what we consider the most appropriate vibrational match for where you are right now. When we give information, we always look at the vibrational level of the majority of whom we think will be reading this. We do this to give you a version of the truth that will best serve you in accessing your highest potential. We are truly excited for you as you embark on this journey. This window in time is rife with amazing potential that is only limited by your imagination. The greatest challenge for you will be to release the constraints of your past beliefs and judgments and know that all things are possible. That is what ascension is all about. Despite negative aspects, games or manipulation, when you recognize that you are a creator being, you can change your version of reality. And when enough of you decide that you want a different version of reality, then a brand new timeline is created, followed by a change in current events, all leading to a brand new world. So, there is only one thing left to do: dream your most beautiful dream!